Stadium concessions have come a long way since stale pretzels and popcorn were about all that hungry fans could look forward to. As we scoured the menus at NFL stadiums, we learned there are some seriously innovative dishes out there. Dessert nachos, anyone? And then there are others -- like a 7-pound burger topped with chicken fingers, fries, hotdogs and more -- that beg the question, "Why?" This is easily the most absurd food you'll find anywhere this season, but we must give some credit to the person who invented this monstrosity for cramming so many stadium staples into a single burger. The Gridiron Challenge Burger is made with five one-third pound burger patties, five hot dogs, five bratwursts, eight slices of bacon ... stay with me ... eight chicken tenders, 20 slices of American cheese, 12 ounces of fries, and "tanker sauce," all stacked on a 10-inch bun. Oh, and let's not forget the veggies - lettuce, tomato and pickles. The price tag on this mammoth 7-pound burger, not counting the toll it surely takes on your heart? $75. So how do you tackle this thing? Your cardiologist would probably appreciate you sharing it with friends, but if you are brave enough to go it alone and can finish in under an hour, you will be rewarded with a personalized Cardinals' jersey and the thrill of seeing yourself on the stadium video board. Frequent eaters of Flamin' Hot Cheetos will know that one of the snack's few drawbacks is the bright red residue it leaves on your fingers. Thankfully, the brilliant chefs at the Texans' stadium have encrusted chicken tenders with Flamin' Hot Cheetos, topped them with mango salsa and Sriracha mayo, and nestled it all conveniently inside a flour tortilla. 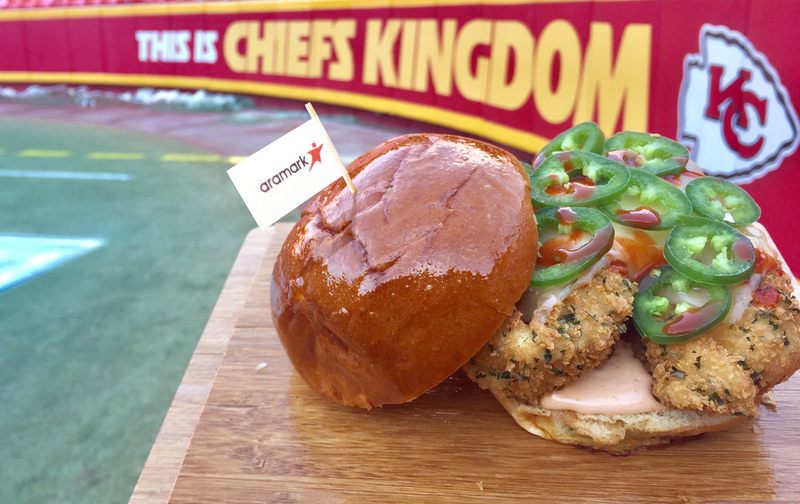 While we're on the topic of "heat," this new sandwich should keep fans brave enough to try it plenty warm on those frigid Kansas City game days. This chicken tender sandwich is topped with a mayo made with the hottest pepper known to man -- the Carolina Reaper. And if that's not spicy enough for you, pepper jack cheese, sliced jalapenos and Buffalo sauce turn the heat all the way up. Not included: water to douse the flames. We're a little skeptical about how you slurp this one at a football game without splashing the fans around you. Regardless, fans of the Seahawks and this hearty Vietnamese soup will have to try this version with braised beef, rice noodles, bean sprouts, Thai basil, Fresno chilis and of course, that rich pho broth. This was another surprising find on a stadium menu, but if pierogies and football is your thing, then a trip to Pittsburgh is in order. 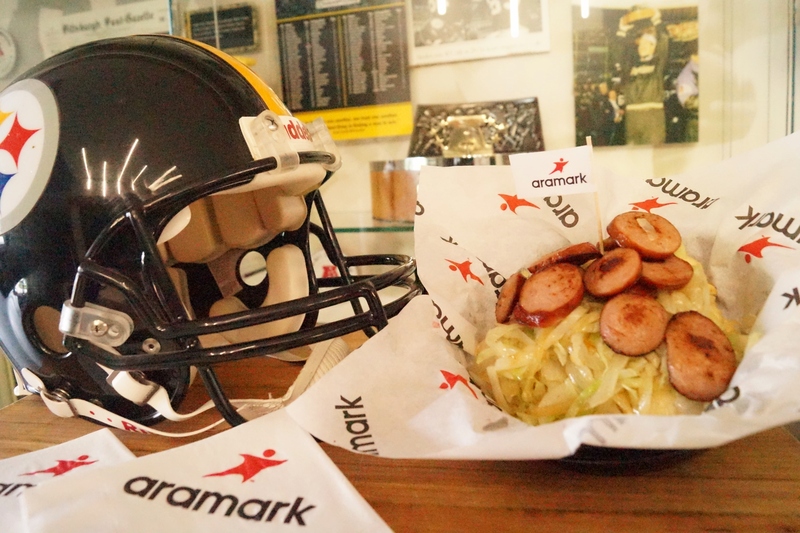 The Steelers' version comes with those delicious little potato and cheese-filled pierogi pillows, topped with braised cabbage and finished with sliced kielbasa. Anyone who has lived in the South or anywhere else near a Chick-fil-A knows the horror of rolling out of bed on a Sunday, craving a warm, buttery, chicken biscuit ... only to have your dreams dashed when you realize the restaurant is closed. Yes, Chick-fil-a is still closed on Sundays -- even the one inside Atlanta's Mercedes-Benz Stadium -- which means they aren't open for many of the Falcons' home games. Fortunately, Falcons fans can get their fix with a "Closed on Sunday" chicken sandwich instead, which, despite the name, IS served on Sundays at chef Kevin Gillespie's stadium outpost, Gamechanger. Gillespie's version comes with fried chicken, pickles, hot sauce and sweet pickled mayonnaise. Like the Gridiron Challenge Burger, this behemoth falls squarely into the "shareable" category for most normal humans. The Redskins' new DMV Super Burrito tips the scales at around five pounds and is stuffed with three pounds of chicken and half-smoked sausage, plus two pounds of Spanish rice, lettuce, tomato, avocado, and black bean salsa. 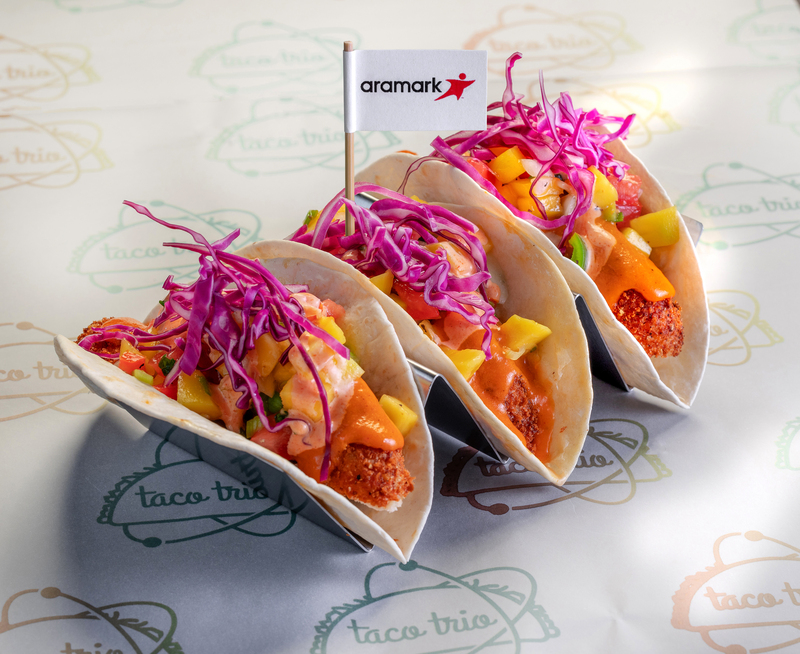 No, it's not your typical fan fare, but the Bay Area is known for its Dungeness crabs, and the 49ers have taken full advantage with this latest concession creation. Straight out of the @LevyRestaurants playbook: the Dungeness Crab Pretzel. Think lobster roll, but on a pretzel baguette with knuckle and claw crab meat tossed with garlic aioli, Dijon mustard and chives. Nothing against the name, but why wasn't this just called "Wisconsin on a Bun?" Let's see -- do we have bratwurst? Check. Cheese curds? Check. Beer incorporated in the mustard? Check. Put on a cheesehead and try one yourself at Lambeau Field for the quintessential Green Bay experience. In the culinary world, there are many classic combinations. Peanut butter and jelly, fish and chips, and milk and cookies come to mind. We may need to add another to that list if this pairing of dessert and nachos is as tasty as it sounds. At Ford Field, the Lions serve it with fried tortilla chips dusted with cinnamon and sugar, then topped with smoked chocolate cherry Nutella sauce, chocolate covered Michigan cherries, sprinkles, and whipped cream.